Washington (AFP) – A Russian military jet came within a few feet of a US destroyer in international waters in the Baltic Sea during a series of “aggressive” overflights, US officials said Wednesday. Russian aircraft repeatedly buzzed the USS Donald Cook this week, including an incident Tuesday in which a Russian Su-24 flew just 30 feet (nine meters) above the ship in a “simulated attack profile,” said the US military’s Europe Command (EUCOM). “We have deep concerns about the unsafe and unprofessional Russian flight maneuvers,” EUCOM said in a statement. EUCOM released video showing warplanes zooming so close past the Cook that one sailor can be heard saying: “He is below the bridge wing,” meaning the plane was flying lower than the highest point of the ship. The maneuvers began Monday while the destroyer was located about 70 nautical miles from Kaliningrad, a Russian exclave, in international waters. 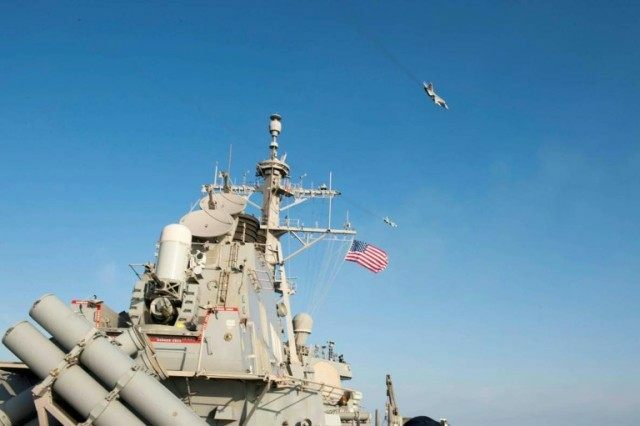 Two Russian Su-24s flew 20 times past the USS Cook at a distance of less than 1,000 yards and at an altitude of about 100 feet, the official said. Then on Tuesday, a Russian Ka-27 Helix anti-submarine helicopter flew seven times around the destroyer, taking photographs as it passed. Shortly after, two Su-24s roared toward the ship, making 11 close-range and low-altitude passes, including one that was “so low it created wake in the water,” the official said. The plane was “wings clean,” meaning it was not visibly armed, he added. US sailors tried multiple times to hail the Russian craft on international frequencies but got no response. “The Russian aircraft flew in a simulated attack profile and failed to respond to repeated safety advisories in both English and Russian,” EUCOM said. A Polish helicopter had been conducting drills on the destroyer and was refueling during one of the overflights. “As a safety precaution, flight operations were suspended until the Su-24s departed the area,” EUCOM said. The Pentagon periodically decries the risky tactics displayed by Russian pilots. “There have been repeated incidents over the last year where the Russian military, including Russian military aircraft, have come close enough to each other or have come close enough to other air and sea traffic to raise serious safety concerns, and we continue to be concerned about this behavior,” Earnest said.